Hi lovelies! If you're anything like me, you have a huge collection of jewelry you've amassed and it seems to reproduce itself overnight. Which means you've long outgrown your jewelry box, jewelry armoire, and it's now overflowing off your dresser, similarly to an erupting volcano's lava flow. And, much like a toddler believes, if you can't see it it's not there. At least for me. So I need things hanging in plain sight, where I can see them without even looking for them. Here's the supplies for the whole project! You'll notice that there's a bunch of old, mismatched earrings, rings, and bits and bobs so get to gathering yours! There's two DIYs here: the boards and the pins. Let's start with the boards! If there's a pattern to your fabric, lay out your cork circles where you want them to be. Cut around the circles, leaving about a 2" border. Fold the excess over and insert a small pin at an angle. Make sure to slide the pin into the fabric/cork at an angle so the pin's tip won't protrude from the front. Work your way around the trivet, gathering, folding and pinning the fabric in place. Voila! Repeat for the others now! Now let's make some jeweled pins to hang your precious baubles from! Old and/or mismatched earrings, pendants, rings, beads, or other pretty pieces. Snip off the posts from any earrings. For the rings just snip as close to the base of the bauble as you can. Repeat for loops from pendants, or anything else that needs to be trimmed off of any other pieces depending on what you have. Apply a small blob of glue to the pushpin, and firmly push into place on the back of the bauble. Let dry for a few hours before hanging. Hang up your cork boards using some sticky mounting squares. For best results and easy, clean removal use the 3M Command strips! And hang some of your favorite pieces! 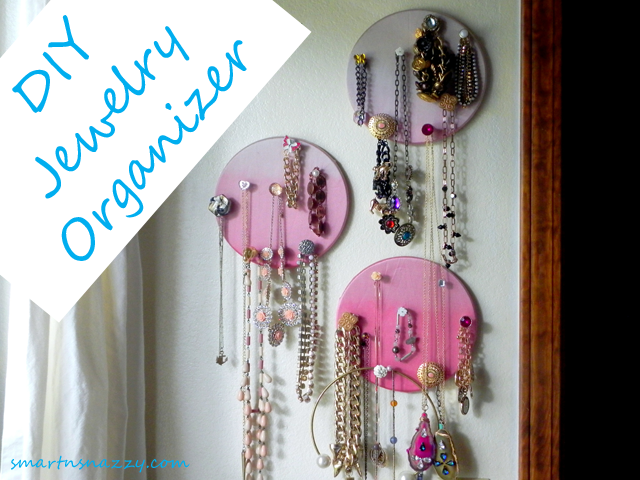 I like to use the upper pins to hang bracelets from and the lower ones for necklaces. This sits right outside my closet, so I see them whenever I walk into it to figure out what the heck I'm wearing. I hung some of my most worn pieces as well as a few I'd like to wear more that I forget about. There's clearly room to pack a ton more in there, but I really don't want it to look like a cluttered mess because then I'll just ignore it or not even be able to discern what I've got in there because everything is so jumbled looking. For this price, I'll grab a couple more packs the next time I hit Ikea and make some more to hang in my closet and put some more beauties on display. I like incorporating the pieces I mean to wear more often, because now I will see them! I plan to switch out the pieces every month - a jewelry mood board for the month if you will - to keep things fresh and new!